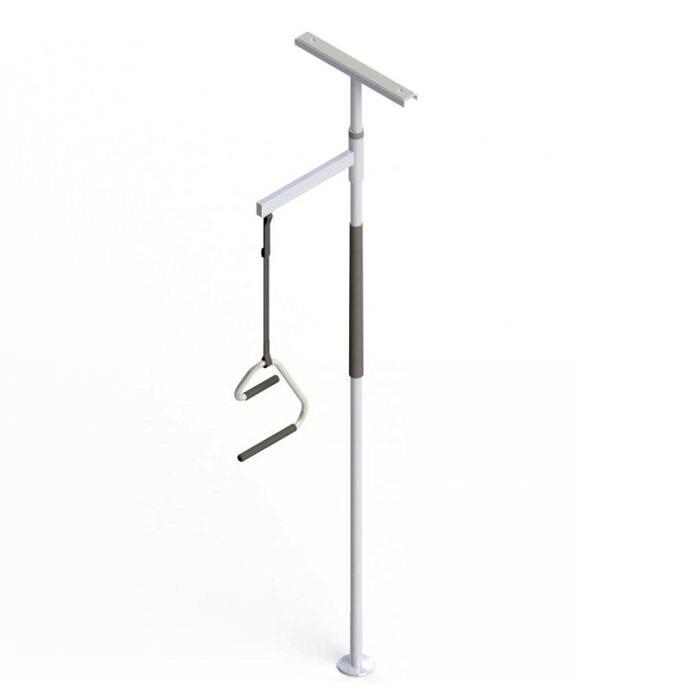 HealthCraft superpole stand assist system comes with an offset supertrapeze handle that mounts to the superpole. The new ergonomic design of supertrapeze reduces wrist strain and is suitable for clients who require moderate assistance to achieve a sitting position in bed. The supertrapeze provides independence to the user in combination with all the benefits of superpole stand assist system. 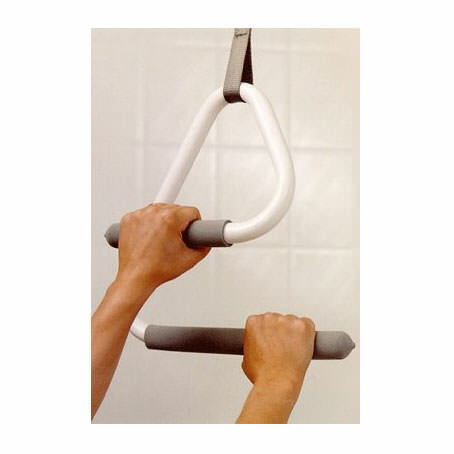 Effective: Supertrapeze includes the innovative e2 trapeze handle with a "ladder-like" set of two rails that allows the user to more easily climb up to a sitting position. 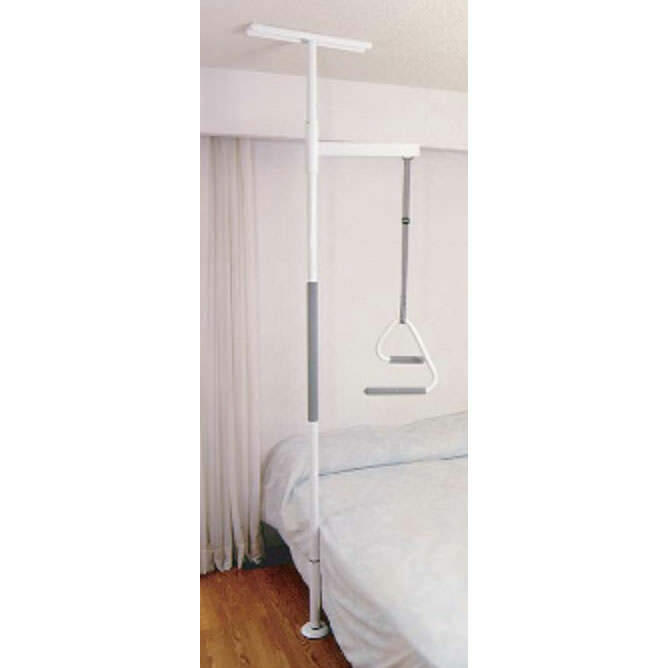 Ease of use: The combination of a Supertrapeze and bedside Superpole provides complete support for sitting up, pivoting, and standing up from bed. Versatile: Does not require special bed or mounting brackets for installation. The Supertrapeze does not force bed outward from wall as with conventional trapeze systems. It can be installed beside waterbeds and electric beds unlike floor mounted trapeze systems. Storage: Open design of trapeze handle allows it to be hooked onto pole for storage. No more than 150 lbs. should be exerted on trapeze system (for repositioning and sitting up assistance only). Support arm length - 17"
450 lbs. (heavy-duty) 300 lbs. Shipping weight Box 1: 5 lbs. Box 2: 13 lbs. Box 1: 14lbs. The manufacturer warrants this product for limited lifetime with the exception of hand grips which are subject to normal wear & tear. The manufacturer will be held free from and against any and all liabilities, claims (founded and unfounded), losses, damages, costs and expenses (including without limitation consequential damages and reasonable professional fees) resulting from buyers specification, application, or improper use of goods described hereon; buyers omission or neglect. The manufacturer does not assume any liability for damage resulting from services performed by others or faulty installation, misuse or misapplication of goods sold. The manufacturer shall not be liable for prospective profits or special, indirect, or consequential damages, or for the cost of any corrective work done without the manufacturer's prior approval. The manufacturer's total liability hereunder shall in no event exceed the purchase price of the goods specified hereon. All returns are subject to 20% restocking fee.